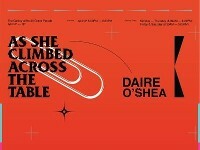 Daire O’Shea is a sculptor, lecturer and writer based in Cork. As a Materialist he is interested in the relationship between digital representations and physical objects. Taking influence from a diversity of areas such as theories of Object Oriented Ontology, Post-Internet Art, science fiction and his own daily interactions with and relationship to objects he creates physical sculptural outcomes as the tangible result of his research. Daire has exhibited in both solo and group shows across the country over the past few years such as The Materialists in 126 Gallery, Galway, Framing Devices in Limerick City Gallery of Art, If you Can’t Handle me @... in Limerick City, Homo Ludens (Man at Play) in The Library Project, Dublin and most recently Rua Red Winter Open in Dublin. As a writer he has published papers, reviews and criticism in a wide variety of publications and on a variety of subjects ranging from minimalism to motorcycles. Daire is an art history lecturer in University College Cork. 'As She Climbed Across the Table' takes its title from the 1997 Jonathan Lethem novel of the same name. Both the novel and the exhibition are interested in exploring the relationships between humans and objects and objects and other objects. Human bias and its tendency to interpret the most basic of physical realities and imbue them with literary or even romantic meaning is a fertile area of exploration for the artist. As a self-proclaimed Materialist, Daire O’Shea is dedicated to exploring how tensions can be created and resolved between various forms and material properties. How materials communicate with one another through physical interaction and how humans communicate and respond to these dialogues. These sculptures and drawings are the physical manifestations of Daire’s research into the philosophical school of Object Oriented Ontology, the 2014 heyday of post-internet art, the slow, relentless deadening of the soul at the hands of infinite scroll timelines and the physical properties and limitations of various construction materials. TACTIC would like to express their gratitude to Crawford College of Art and Design CIT for the use of their beautiful space The Gallery at No. 46 Grand Parade.